Often referred to as the voice box, the larynx is best known for its role in speech, but also constricts during the process of swallowing in order to protect the airways from food, saliva, and other materials and opens up at other times so air can be moved into and out of the lungs. The vast majority of cancers that affect the larynx arise in the squamous cells of the epithelial lining. Only about 5 percent of laryngeal tumors develop in the glands beneath the epithelium or other areas of the larynx. 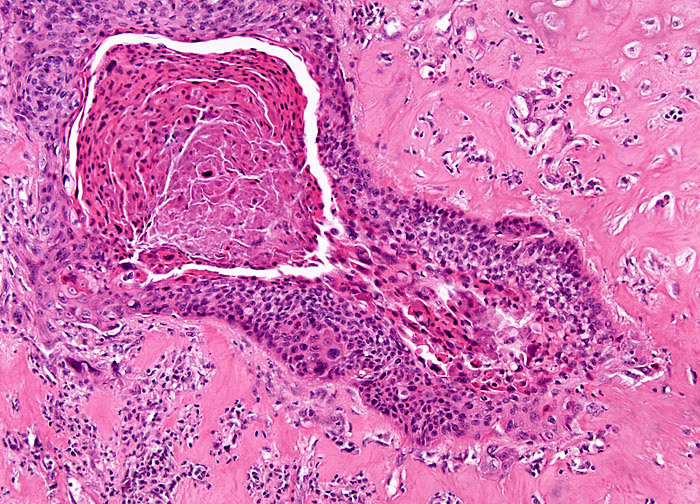 Generally, squamous cell carcinomas of the larynx initiate from one of several different precancerous conditions, such as squamous intraepithelial neoplasia or dysplasia, which may also occasionally disappear untreated, particularly if smoking or other activities that contributed to their development in the first place are discontinued.